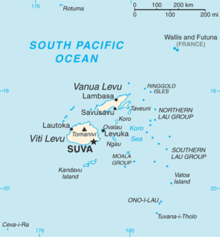 Suva is the capital city of Fiji. It is on the southeast coast of the island of Viti Levu. Suva became the capital of Fiji in 1877. It was changed from the settlement of Kaivalagi on the island of Ovalau because that settlement had no space left to grow. Kaivalangi had been established by the Europeans. In 1996, 77,366 people lived in Suva. Including independent suburbs, 167,975 people lived in the Greater Suva city area. This page was last changed on 18 March 2016, at 02:08.